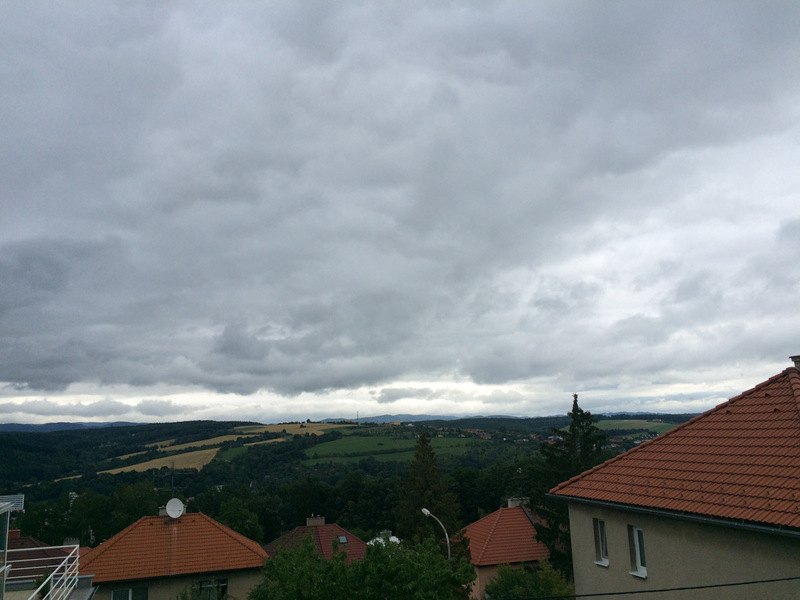 The heavy clouds clad in a long veil of grey are hanging over Zlin. It is the same window overlooking the same hills that greeted us for the past 2 days in our Czech home. Yet these clouds make the view so different, so intense. I love such days. The smell of the air is so fresh filled with a threat of a downpour, the scenery opening up to the eye is so crisp, sharp and intense. It is amazing what a difference clouds make to the day. This is the beautiful morning that greeted us on the 7th day of our adventures. Today we have an important appointment in our calendar – at 13:00 our Rover is going back to the workshop and coming out of there hopefully in tip top condition so we can continue our trip towards our next destination Slovakia! Until then though there are still a few hours at our disposal, so after packing and saying goodbye to our Czech family, we head to our usual starting point in Zlin – Building No. 21 on tř. 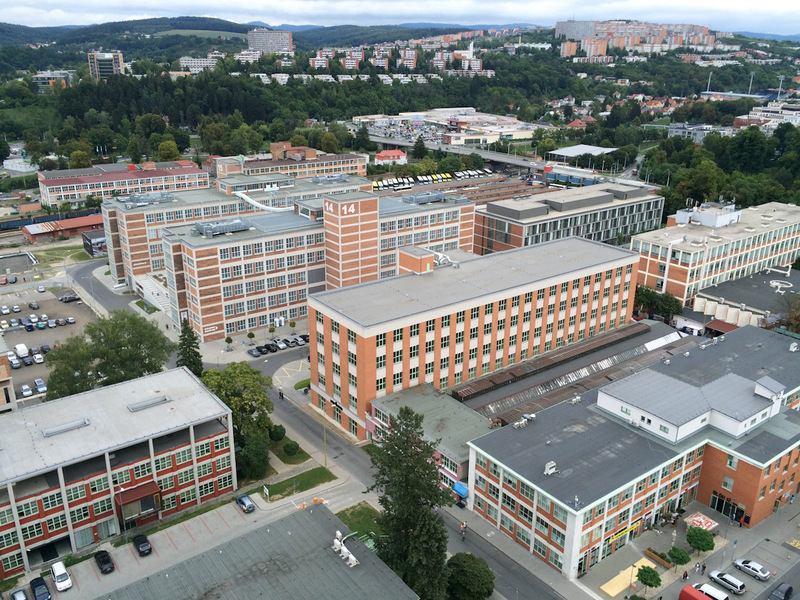 Tomáše Bati 21, 760 01 Zlín, aka Bata’s Skyscraper. Andreas making it absolutely clear that we are standing by the entrance of Building 21 and leading the way into the skyscraper. Some kind of government function is housed inside the famous building today. But back in its heyday it used to be the headquarters of Bata’s shoe empire. In the 1930s when the construction was completed the 21 was one of the first skyscrapers in Europe. The soul of Bata can still be felt in the long corridors, old elevators and countless of doors lining up all the 16 floors of the skyscraper. 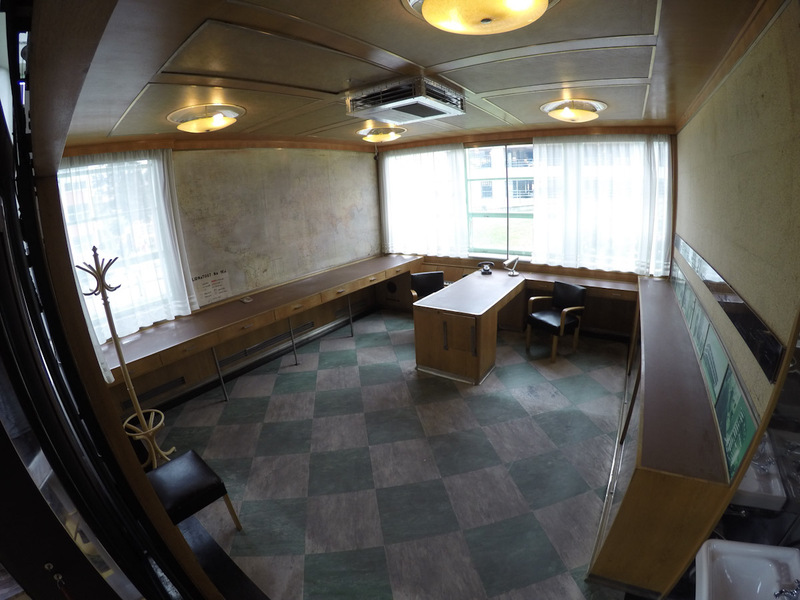 The interior was rather reminiscent of the Soviet taste in architecture. 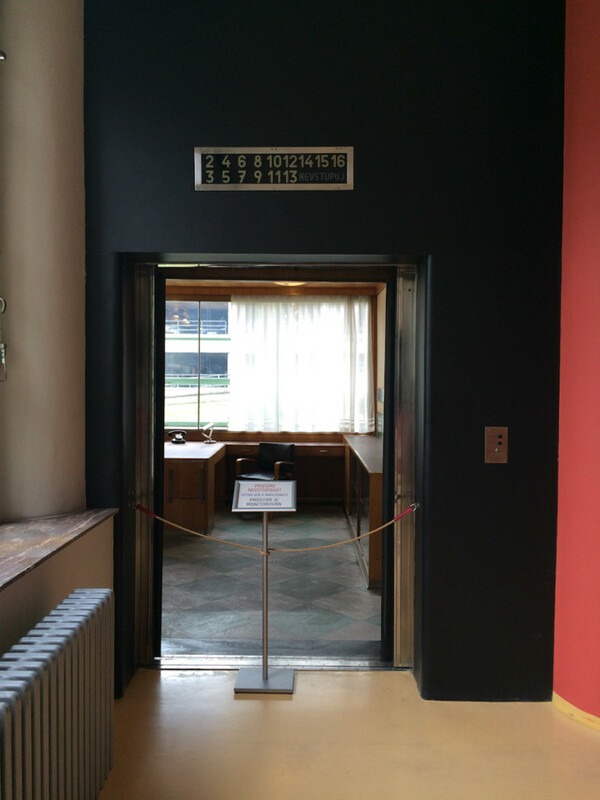 Inside we found Bata’s museum and a very interesting exhibition – an elevator that doubled as a personal office of no one else than Thomas Bata himself! It was quite a sight. Nothing luxurious and imposing to convey Bata’s rank and status. Quite the opposite, the big room was rather modest in decorations. The only “luxury” he allowed himself was to build his office inside an actual elevator so he could move in between the floors, attend meetings, be on the shop floor and check up on his empire with ease. This is one inspiring and visionary CEO I would have loved to have met in person. Office inside an elevator. What a brilliant idea is that and something that many CEOs could take inspiration from. Apart from the office-in-elevator there are other interesting details about Bata and his legacy to be learnt in the museum. 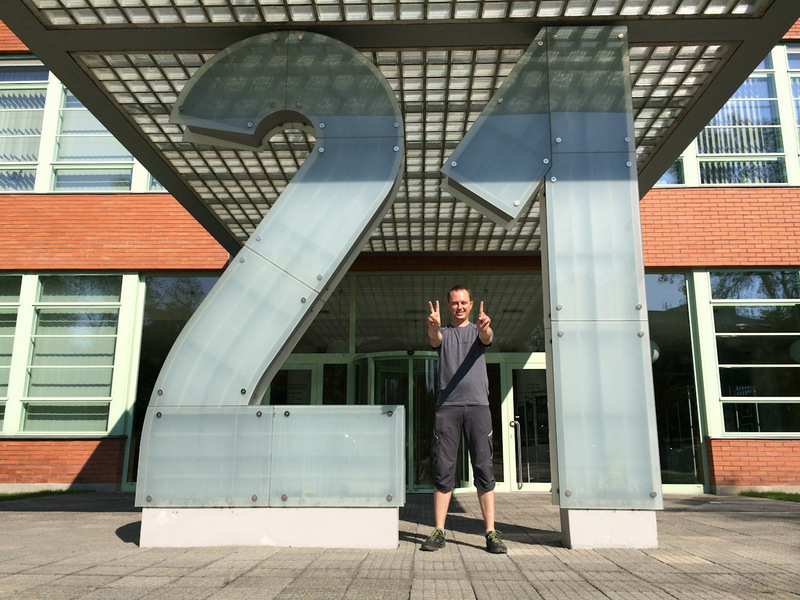 If you ever make it to Zlin, do stop by Building 21. 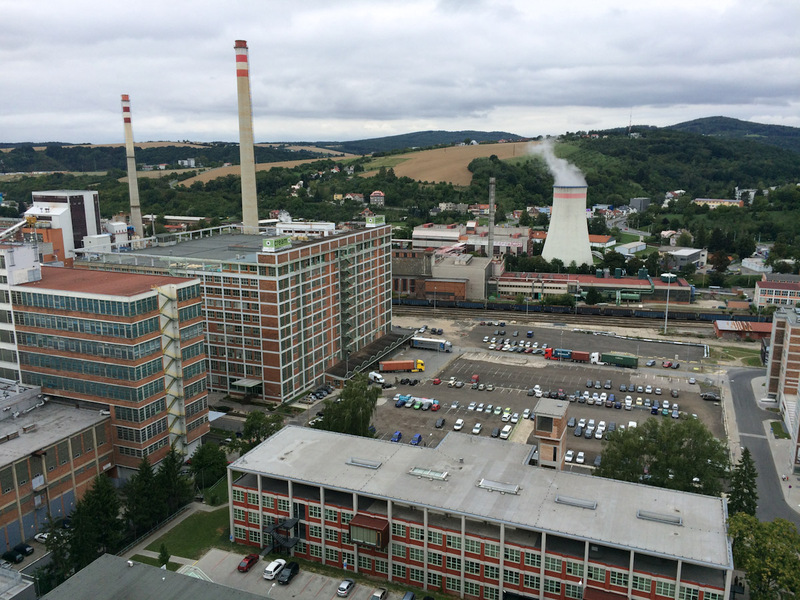 After walking through Bata’s history down in the museum, we took an old-fashioned open-door or rather no-door elevator up to the last floor to look at Zlin, the city, boldly dreamt and meticulously realized by Thomas Bata. Up on the top floor of the skyscraper there is a open terrace overlooking the city. There was also a café that looked rather empty and off service when we were there, but it could be open in the summer months. Rows and rows of mostly identical brick and glass structures. This is Zlin from above. Rows and rows of mostly identical brick and glass structures. 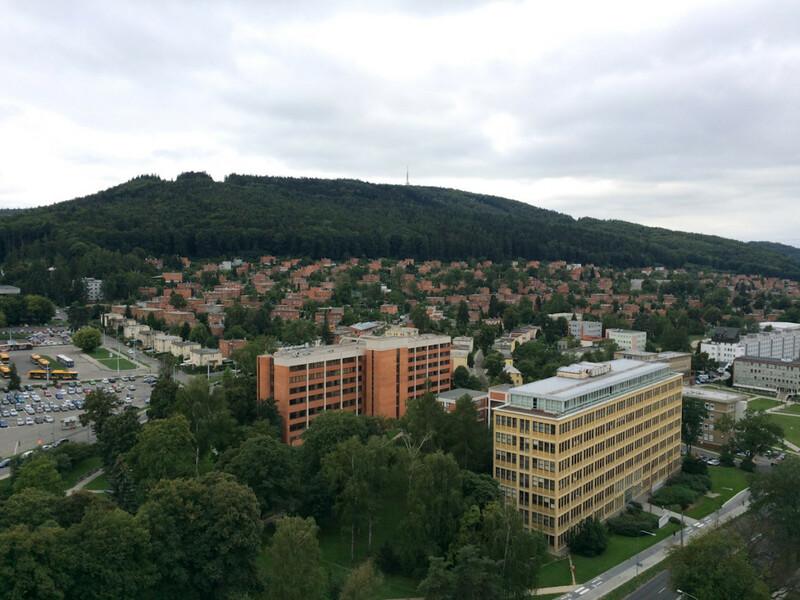 This is Zlin from above. A city inspired by Le Corbusier’s urban modernism, a city designed for function and daily life. Today, decades after their completion, the brick and glass structures still stand tall, however there is a certain air of sadness that has descended on them. Maybe it is the longing for the good old days, maybe it is a cry for maintenance… It is hard to say. View to the Letna district, where the lovely family hosting us was also living. After getting our fix of bird’s eye view over the city, we descended back to the ground floor to find the restaurant we read about online. The restaurant turned out to be the canteen for the people working in Building 21 and we arrived right in time for the busy lunch hour. Luckily we weren’t asked to produce employee IDs, nor asked to pay with a lunch card. 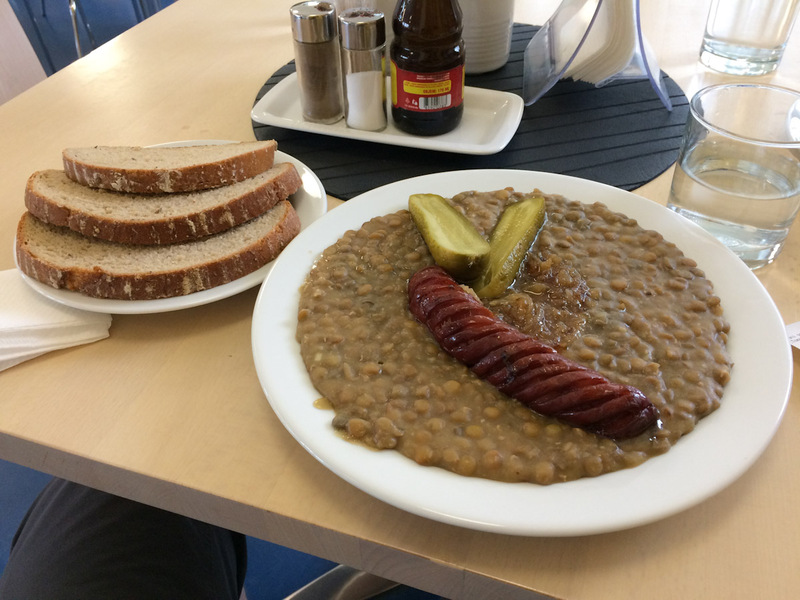 After humble attempt at explaining that we would like some food we were shown to an empty table and brought what happened to be the day’s menu of complimentary soup and this delicious lentil and sausage dish. Though delicious, the lunch was no gourmet 2-hour long affair, we had to be done very quickly and rush back to the car workshop. It is time! Two happy travellers waiting on the oh-so-familiar sofa on the second floor of the oh-so-familiar Land Rover dealer shop. Here we are waiting for hours while our car is in the workshop mostly sitting idle waiting for the mechanic to exchange the faulty part. In Zlin we did a lot of waiting but hopefully it will be over today and we can get on the road again. Finally after around 4 hours of sitting on the oh-so-familiar sofa on the second floor of the oh-so-familiar Land Rover dealer shop and keeping our fingers crossed for the car, we get the news that the Rover is ready! Hurra…!!! 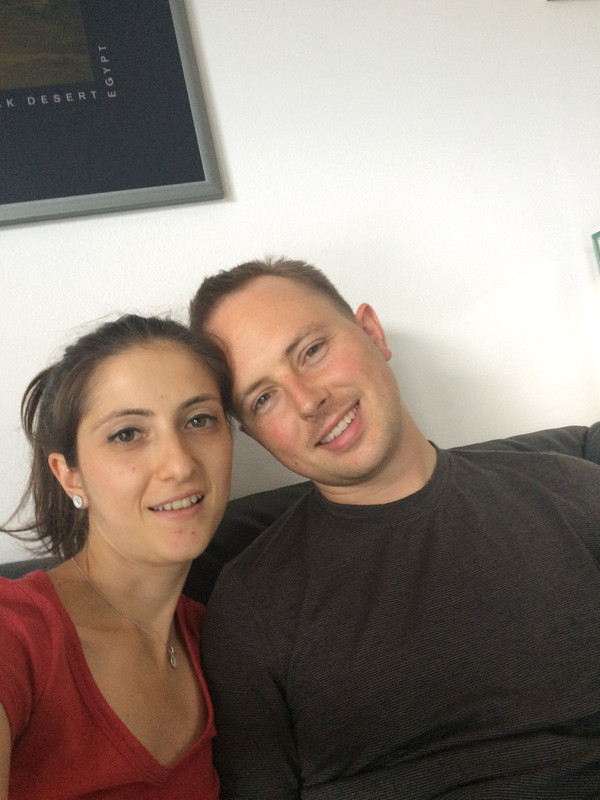 After 3 days in Zlin, way behind our schedule we are longing to get on the road and reach Slovakia. After settling the rather fat invoice we, all in smiles of getting the car fixed head to the front where our green-coloured beauty is awaiting us. Alas today wasn’t our day. After driving for about 10 km the car stops again showing the exact same problem of the engine simply dying. It is past 17:00, the dusk is approaching and there is still a few hours of drive to get us to Slovakia. I am on the verge of screaming, which I do getting on the phone with the workshop guy who was spellbound that after making us wait for days they did NOT fix the right problem and unfortunately cannot do anything anymore today as the workshop is about to close. Having no other choice we drive back to our wonderful Czech family to spend yet another, needless to say, not so carefree night in Zlin. As Alena, our host was hurrying calming tea and her home-made honey to help us get through the stress of the day, Andreas took the matters in his own hands and spent a few long hours scouring the Internet on the potential causes of the car malfunction. It must have been our day after all, as his patient efforts paid off, and people, real Land Rover aficionados and experts, unlike the official branch we had the “pleasure” of dealing with, knew exactly what was the root cause of the car misbehaviour. And of course it was not the throttle body that the workshop diagnosed and made a hefty invoice for, it was nowhere even close to that. Something quite different and very easy and far cheaper to fix was to be blamed for. But the hour is way past midnight and we need to sleep. 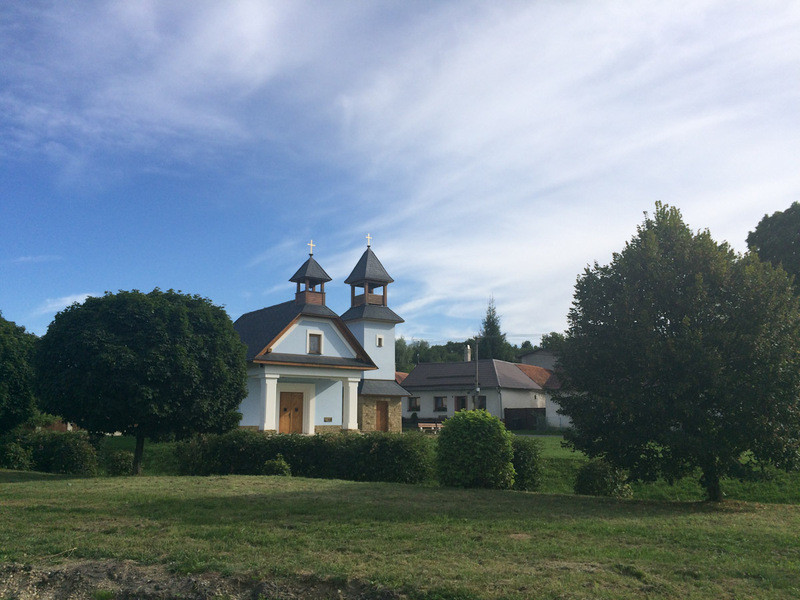 This entry was posted in AA on the road, Travel and tagged aaontheroad, architecture, Bata, czech republic, depihayastan, eastern europe, land rover, Le Corbusier, roadtrip, travel, zlin by Anulik. Bookmark the permalink. Medieval walls, terra cotta roofs, 350 height meters, buggy rides – that’s a day in Dubrovnik!